The second installment in the extraordinary Cooper Devereaux mystery thriller series, which combines the atmosphere of James Lee Burke and Craig Johnson with the noir brilliance of Robert Crais. n arsonist is targeting schools in Birmingham, Alabama—with devastating effect. Detective Devereaux—a man you can't quite trust and should never ignore—must put a stop to the elusive pyromaniac's reign of terror before more damage is done. Or worse, before students' lives are lost. But as Devereaux sifts through the ashes of the case, a grisly discovery at a burned-out school sends the investigation spiraling in a new, terrifying direction. The detective and his partner are dragged into a nightmare world by revelations of gruesome rituals, the disappearance of local citizens, and allegations against city officials of shocking crimes that stretch back decades. With innocent lives on the line, progress is hampered by friction between the police department and the FBI, and interference from factions of the local underworld complicate matters further. Devereaux doesn't make excuses for his willingness to work outside the lines, but just as he needs to be at the top of his game, he's rocked by echoes from his troubled past that threaten to engulf his daughter and girlfriend—and fracture the life he's only recently begun to rebuild. "VERDICT: The second installment starring Devereaux (after False Positive) is a suspenseful action-packed drama that is sure to please fans of the series and mystery / thriller lovers alike." "Tension-filled ... series fans will be pleased that there's more to come." 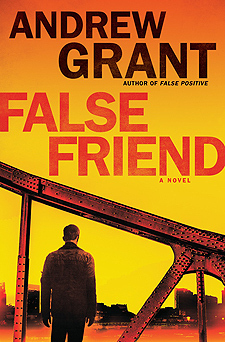 "An incendiary thriller featuring the return of Birmingham, Alabama, detective Cooper Devereaux (False Positive, 2015). The story zips along ... chockablock with disturbed characters, but Cooper is solid—decent, flawed, and entertaining. A quick, enjoyable entry in the series."